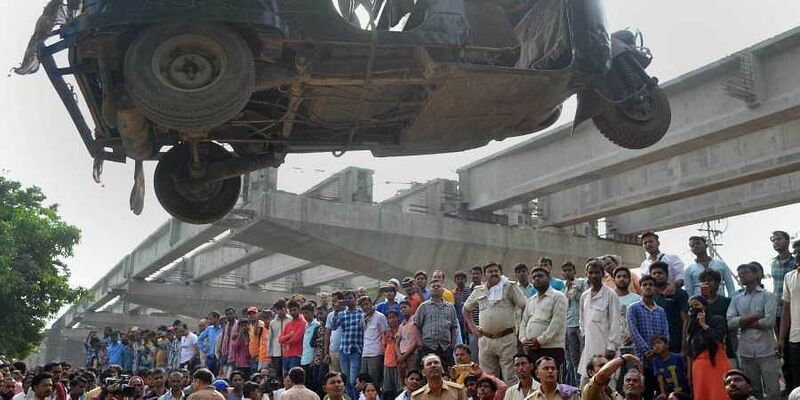 At least, 15 persons were killed and several others were injured when two beams of an under-construction flyover collapsed near Varanasi railway station on May 15, 2018. LUCKNOW: Acting on the probe report in flyover collapse case in Varanasi, the crime branch of UP police arrested as many as eight persons, including seven engineers of UP Bridge Corporation and a contractor here on Saturday. All the eight persons arrested were booked under Sections 304 (culpable homicide not amounting to murder), 308 (attempt to commit culpable homicide), 427 (mischief causing financial damage), 34 (acts done by several persons in furtherance of common intention) of IPC and 3&4 of Prevention of Damage to Public Property Act. The persons held on Saturday included former project manager Genda Lal of Aligarh district, the then chief project manager Harishchandra Tiwari of Pratapgarh district, the then project manager Kuljas Rai Sudan of Meerut district, assistant engineer (civil) Rajendra Singh of Mirzapur district, assistant engineer (mechanical safety) Ramtapasya Singh Yadav of Lucknow, junior engineer (civil) Lalchandra Singh of Chandauli district, junior engineer (civil/safety) Rajeshpal Singh of Ghazipur district, and contractor Saheb Hussain of Siwan district in Bihar. According to Varanasi SSP Anand Kulkarni, the arrestes were amde following the probe report and the accused persons were being sent to jail. In fact, a team of Central Building Research Institute (CBRI) had inspected the flyover site and sent a detailed report, which was the part of police investigation. "In its report the CBRI had pointed out that many technical errors and irregularities in construction methodology. These persons were arrested on the basis of this report and other evidence," said the SSP. If anyone cares please check the bridge of Agwanpur in Moradabad, this bridge has Z design and shape, it has claimed 3 lives in my knowledge, I am afraid more lives are at stake.